Lander, Wyoming is a small town where the Rockies meet the High Desert. We were not crazy about Lander. Most Jeep trails in the National Forest were just roads through the woods, and some were not wide enough to be called that. The runs we made out through the high desert were enjoyable. Lots of wildlife and wide open country. ​Interactive map of ALL TRAILS down the page! This Region is set up differently than all the other Regions on Jeep the USA. Only a brief description of trails is given below, and the only map is the interactive one. A wildlife run through the high desert south of US 287/Jefferson City. 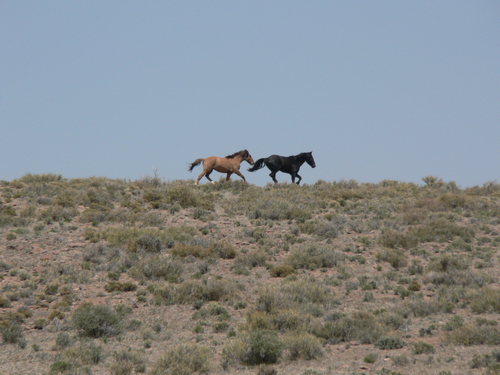 We saw a scadzillion antelope, two small herds of elk and perhaps a dozen wild horses. All graded roads drivable at 25 to 55 MPH. Scenery is nothing, it is all about the animals. Probably not suitable for a large group because the wildlife will be gone by the time the fourth Jeep gets to where the wildlife was. 6-7 hours in total from Lander. A fairly easy drive into high country. Some open country, some narrow trails through the trees. A fairly easy road through mostly open areas, with a couple stretches of narrow twisty road through the trees. Some of this trail was open with a bit of scenery, but sizable stretches were narrow "roads" that still had the stumps in them, and it did not appear that any rocks had been bulldozed from the right-of-way. The eastern portion of this trail is the 2.0 portion, and then it turns to GP for the rest of the way to Atlantic City via a well graded road. The first few miles follows the Oregon Trail, Mormon Trail and the Pony Express Route. There are frequent cement markers showing trail locations. This section would be very interesting if a person researched the history to learn about the area. This is the major access road to trails in the Shoshone National Forest. All trails on one coherent map. ​A topographic map is available. All GPX files above in one ZIP file. Use this to download all data at once, or if you have trouble with GPX downloading.